Hillary Clinton was supposed to don red, white, and blue pantsuits and cruise to victory over the clownish Donald Trump. Unfortunately Clinton is not a closer. In the past 8 years she was the heavy favourite to defeat Barack Obama and now Donald Trump in her runs for president. In both cases, she fumbled on the goal line. Clinton’s sobbing supporters now must make peace with The Donald. 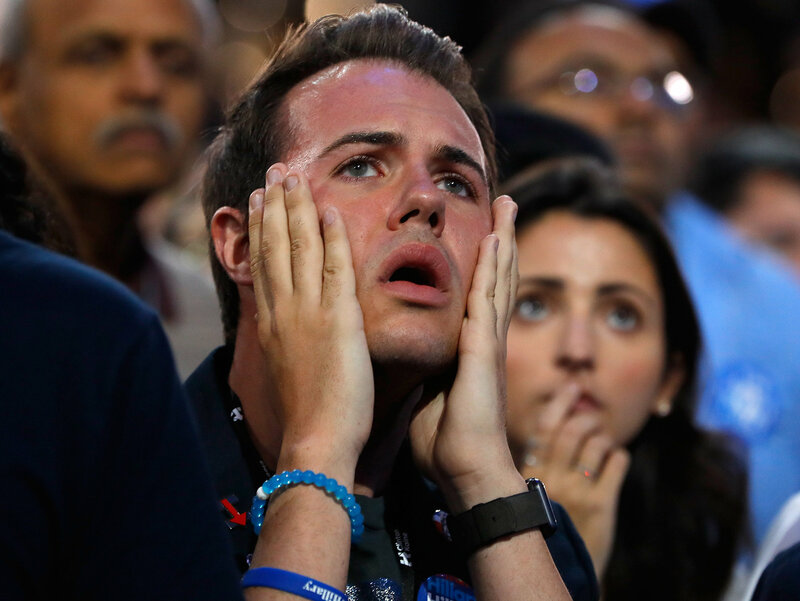 Faces of REKT is an apt description of the despair witnessed at any pro-Clinton rally. Now that the circus is over, what does Trump mean for Bitcoin? Trump and his Republican party captured both the House of Representatives and Senate. He has a unique opportunity to deliver on his campaign economic promises. Trump promised to reduce personal and corporate tax rates, eliminate burdensome regulation, and increase infrastructure spending. These nationalistic economic goals will crown The Donald as The Strong Dollar President. America-first economic policies will have profound implications for the USD, Europe, and China. Central banks globally have lamented the lack of fiscal spending to help revive economies globally. With Trump and a Republican controlled congress committed to fiscal spending, the Fed can normalise rates. This fact was not lost on the market. 10yr and 30yr Treasury yields spiked higher. Trump plans to reinvigorate corporate America through tax cuts and the elimination of regulation. He also plans to punish corporates who offshore production through high tariffs. The net result of these policies is more investment and production onshore. This is USD positive. Santa was kind to me with a Trump victory, and it appears my second wish for a Fed rate hike is still in play. The Brexit and Trump victories represent a continuation of economic nationalism. This goes directly against the system EU bureaucrats created. Southern European nations suffer high unemployment and low to no growth due to their inability to correct EU economic imbalances through monetary policy. The suffering plebes have had enough. British and American citizens will now pursue national interests over global ones. This will fire up Greek, Italian, Spanish, Portuguese, and French people. If these oppressed nations followed their own interests, they would repudiate the economic diktats handed down by Germany and the ECB. That entails the return of national currencies and independent monetary policy. December 4th might be the day that ushers in a violent risk-off period due to the Italian constitutional referendum and Austrian presidential election. Prime Minister Renzi stated he will resign if the referendum is defeated. The referendum will be a prelude to national elections where Mr. Grillo’s 5-Star Party, which is anti-EU, is slated to win. “Austrians will vote in a presidential election that could see Norbert Hofer of the Freedom Party become the first far-right head of state to be freely elected in western Europe since 1945.”[Zerohedge] He certainly will not be welcomed by the usual coterie of EU bureacrats. During the various debt renegotiation talks happening in the months to come, the Greeks might finally discover their backbone. This opens the door for the Greeks say bye bye to the EU and Euro. French presidential elections will be held in the summer of 2017. Marine Le Pen, who would exit the EU if elected, is polling better and better. Polls still place her behind front-runner Alain Juppe. That could change quickly as other like-minded politicians take the helm of neighboring countries. The granddaddy of all European elections occurs in the fall of 2017. Frau Merkel is facing a revolt at home over her controversial immigration policies, and her continuation of bailouts for Germany’s lazy European neighbors. The Alternative for Germany party continues to gain momentum. They also plan to exit the EU if voted into power. Before any of these elections cause any choas, a European banking crises precipitated by a banking crisis is more likely to intensify the strain on the EU project. Deutsche Bank has still not raised equity capital or received a lighter penalty from the US Department of Justice. Italian banks are still insolvent, but a national bailout is not permitted under EU rules. These banks must be recapitalised. A bail-in or bail-out will occur. A depositor bail-in will spark bank runs accross Europe. A bail-out will be deeply unpopular and most likely require printing billions of Euros. Pick your poinson Draghi. While in America the yield curve is steepening, the ECB has shown no interest in allowing long-end rates to rise. The ECB is killing its member banks. While the market forgot Europe’s troubles in the lead up to the US elections, expect renewed focus on its broke banks. As I have repeatedly stated, the PBOC doesn’t desire a rising USD. The PBOC is forced to devalue the Yuan as the USD rises. USDCNH in the Trump victory aftermath hit fresh highs of 6.83. The PBOC will not be measured in its devaluation of the CNY if the Fed doesn’t get the message and hikes in December. Unable stem the creation of credit by China’s banks due to politics, the PBOC will have to export this Yuan liquidity through a weaker currency. A stronger USD makes this process more chaotic as capital outflows will intensify. Trump’s economic nationalism will fuel the USD rally. This spells trouble for Europe and China. With two of the three largest trading blocs likely to experience currency and banking crisis, Bitcoin will shine. Time and again Bitcoin has proven to be a safe haven asset during times of market volatility. Imagine what Bitcoin will do when Europe and China’s SARS chickuns arise and come home to roost. I reiterate my $1,000 price target for Bitcoin by year end.